Low Town is a truly involving tale requiring the reader to focus, to remember details, to piece together a complex story (and backstory), as well as to piece together an entire dystopian society. And Daniel Polansky skillfully, but at his own pace, provides bits and pieces and clues about this intriguing world for the reader to digest. Yet this is also a story in the noir tradition. Mr. Polansky has clearly paid his noir dues, as shown by passages reminiscent of the abysmal squalor described in David Goodis’s novels and the wisecracking irony of Raymond Chandler’s Marlowe. The story and its main character, Warden, reside in a world that combines noirish squalor with magic and sorcery. Warden is a former police investigator, banished in disgrace (a common noir scenario). But now he’s a drug dealer, trafficking in substances with names like pixie’s breath and dreamvine. Warden’s world is unknown to the reader. Is it the future, another planet, some combination of Blade Runner and Orwell’s 1984? In fact, Low Town is a great book to read in these times when we tech-obsessed readers complain of lacking focus, zipping around the Internet, and getting instant links and definitions for unknown terms. Reading Low Town requires the reader to build understanding in context, methodically piecing together the intriguing and complex puzzle. For example, Warden, lives in Rigus. Is it a world, a continent, a nation? It’s a long while before the reader finds out. Hints and memories begin creating Warden’s history. A street kid, his parents died in the one of the “plagues” that hit Low Town. He was taken in and raised by a man known as the Blue Crane, a magician, and apparently the one who protects Low Town. Without the Crane’s intervention, many more would have died in the plague. And this plague infested Low Town is one of the poor sections of Rigus. Various ethnicities populate other poor areas—the Kiren and the Islanders, for example. And, again, it is up to the reader to piece together the details of these groups. There is also a wealthy ruling-class aristocracy, mostly of yet another ethnicity—the fair-skinned, blue-eyed Rouender, with long, “arrogant” noses. Some members of this elite run the government; while others live dissolute lives reminiscent of the French royal court of the 17th century, complete with a depraved masquerade party. As the story begins, Warden is five years out of the police force. He is involved in his drug dealing and his own drug habit. He hears news of the murder of a young slum girl named Tara. The entire community is distressed—even the cynical, hard-boiled Warden. Then, as Warden walks through an alley to a drug deal, he notices a strange chemical smell. The unusual smell leads him to a mangled dead body—that of young Tara. Seeing two slum kids, he sends one to return his valise of drugs to the inn where he lives. He sends the other for the police. The first police to arrive are those nicknamed “the hoax.” This lowest level of the police force is notoriously incompetent—leading to a few Marlowe-type quips from Warden. But then come the serious police, called “the Agency,” nicknamed “the Chill” because of their light gray uniforms that resemble ice. They recognize Warden—he was one of them before his banishment. Yet in spite of their relative competence, Warden has little confidence that the Chill will find the killer. Warden begins his own investigation out of a sense of justice, but also to erase any suspicion of his own guilt. He keeps in mind the strange chemical smell. He investigates local factories that use such chemicals until he finds the smell—emanating from a Kiren loner, who, in Warden’s view, looks like a murdering pervert. Warden follows the Kiren, intending to wield his own justice and murder Tara’s killer. But as he’s about to strike, something chilling happens . . .
A massive, feces-stinking blob of a creature appears—a type of creature, Mr. Polansky hints, that Warden has seen before. The grotesque monster rips the shrieking Kiren to shreds. With the sickening killing of the Kiren, it would seem that the case of the murdered child, at least, is solved—and quite early in the story. But the murders of young slum children continue, now, it seems, by the horrid creature itself. After more investigating, Warden gets on the trail of Count Beaconfield, aka “the Blade,” an aristocrat greatly in need of money and known for his unmatched artistry in knife battles. (Strangely, there are no guns in this story; everyone fights with a knife of some sort.) In the employ of the Blade is a rogue magician, Brightfellow, undoubtedly, in Warden’s mind, the one who summons the stinking abominations. Warden spends a good deal of the book tracking and investigating the Blade and his magician. The reader may begin to wonder why Mr. Polansky stretches out the certainty of the resolution. But it wouldn’t be a spoiler to reveal that there is a surprise ending. How much of a surprise and how satisfying it is can be left to the reader to decide. In other words, as with many very good novels, the resolution is not necessarily the best part of Low Town. Read this novel for its dark, involving narrative; its mystery—both criminal and magical; as well as its unforgettable characters, settings, and action. So perhaps we shouldn’t call this a fantasy, especially not a dystopian fantasy. What’s so especially dystopian, or even unusual, about a society with corruption, poverty, drugs, and a wealthy ruling class? Call it instead a deeply noirish, hard-boiled mystery that features magic and sorcery—both of which lead into a deadly, stinking void. Isn’t that stinking void where most noir characters and stories are headed anyway? So don’t be put off by the magic and sorcery. 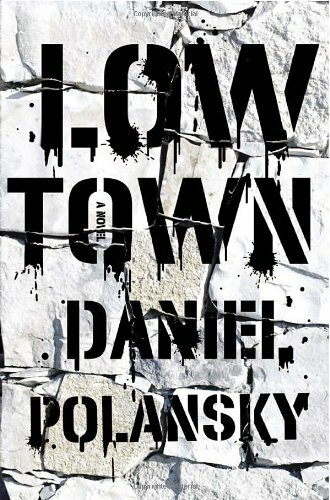 If you like noir and hard-boiled mysteries, you might want to give Low Town a chance. You’ll definitely find it darkly rewarding.